Returning to St. Albans Bay is always like returning home. I lived in Fairfield, just east of St. Albans, for 25-years and still own land on French Hill in St. Albans town. I began my career as a diving instructor at Hathaway Point teaching classes at Camp Kill Kare, a Vermont State park. It was at that time I began to study maritime history of St. Albans Bay, a rich history that profoundly connects St. Albans Bay to the Lois McClure and the story of Lake Champlain’s sailing canal boats. When the American Revolution ended, settlement in the Champlain Valley rapidly expanded and communities around the lake were established and thrived. The community of St. Albans Bay became an important location for importing much needed products like tea, salt and rum and exporting potash and other agricultural products from a vast area around the Bay. A brisk trade was established with nearby Canada which made this northern territory a bitter opponent of the Embargo Act enacted by the Federal government in 1807. The Embargo was aimed at Great Britain in retaliation for their impressments of sailors and interference with American shipping on the high seas…underlying causes of what would blossom just a few years later into the War of 1812. St. Albans and Franklin County, so dependent on trade with British Canada, became one of the most defiant and active smuggling venues on Lake Champlain. According to historian Allen Everest, “The Franklin County militia were ordered to duty at Windmill Point in Alburgh, but perhaps they knew many of the smugglers, [log] rafts continued to get by at night” and so they were replaced by militia units from Rutland County. In 1808 the infamous smuggling boat the Black Snake was operated by St. Albans area crews during the fateful and fatal encounter with Revenue Agents. In this encounter three agents were killed in a confrontation with smugglers and one smuggler, Cyrus Dean was tried and hung in Burlington. St. Albans Bay remained an active smuggling area throughout the War of 1812. After the war, St. Albans Bay continued as an expanding maritime community. For a time it rivaled Burlington Bay for the distinction of being the most active maritime port on the lake. Early lake sloops and two early steamboats, Franklin (1827) and Macdonough (1828) were built and launched on its shores. However, it is the sailing canal boat connection that is at the heart of our story. In 1823, the Champlain Canal connecting Lake Champlain and the Hudson River with a 63-mile long engineered waterway was on the verge of completion when two St. Albans merchants, Nehemiah Kingman and Julius Hoyt , began to contemplate the new opportunity. The canal would provide them and other lake merchants with access to markets from Waterford to New York City and dramatically add to their commercial options. In the course of their conversations, they struck upon a radical idea – why not build a boat with dimensions capable of transiting the new canal, but equipped with a sailing rig so that it can come and go from St. Albans Bay to the entrance of the new canal under its own power. That concept for a boat that could sail on the lake and transit the canal became the Gleaner of St. Albans and in September 1823 it became the very first boat to transit the completed canal. The Gleaner’s passage was so momentous that it was covered by the newspapers of the day, which reported “the vessel was built as an experiment and is found to answer all the uses intended. She sails as fast and bears the changes of weather in the lake and river as well as ordinary sloops and is constructed properly for passing through the canal.” Mercantile Advertiser of New York City. The Gleaner was the first documented Lake Champlain sailing canal boat. Sitting at the dock-of-the-bay in the historic bay it was possible to imagine the busy waterfront almost 190 years ago and the excitement that must have been growing in anticipation of the new canal and the opportunities it would bring to the community. If anything, those expectations proved to be understated as the new canal brought an unprecedented prosperity to the lake. St. Albans Bay, briefly renamed Port Washington in honor of our first president, continued to thrive until the railroads changed the mode of commerce, helping to establish St. Albans City as a railroad power but depriving St. Albans Bay of their commercial dynamics. We arrived on Friday afternoon under the command of Captain Erick Tichonuk, who was also coming home, having grown up in St. Albans, attended all St. Albans schools and graduating BFA [Bellows Free Academy] before attending UVM. Erick’s parents John and Meg and an extended family still reside here. 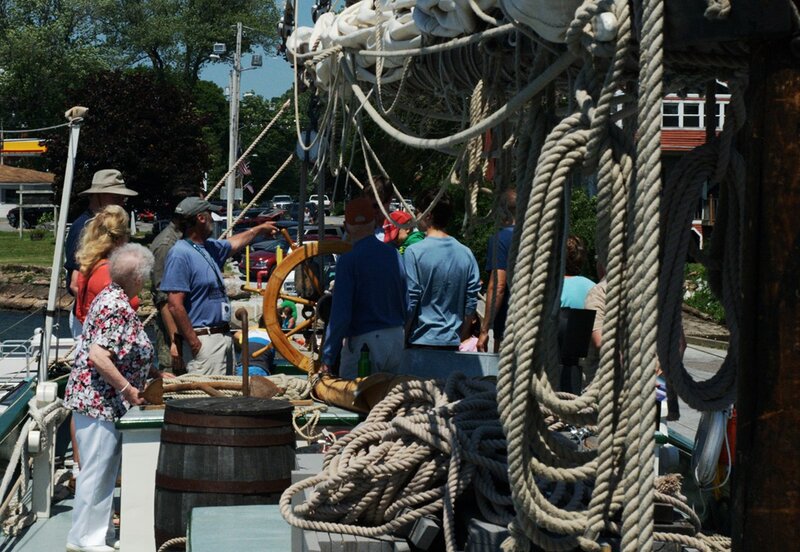 By Saturday morning the weather was beautiful and remained so all weekend as more than 500 people came aboard, most for the first time, to discover this connection to their maritime roots. It was a wonderful two days of visits, conversations and reflection back to a time when St. Albans Bay was not just the beautiful indentation on Lake Champlain, but a vital link to the outside world. 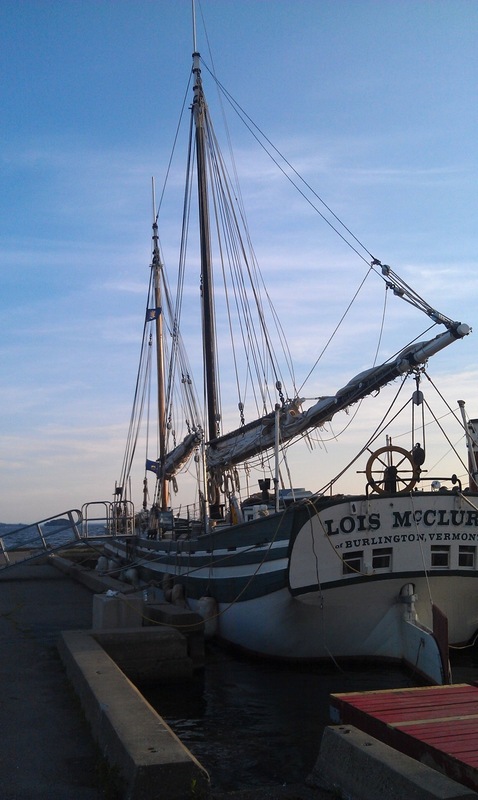 On Monday morning, with a fresh breeze blowing from the south, Captain Roger Taylor and Commissary Kathleen rejoined the crew after a week of sailing in the BVI’s and we motored out of the bay and headed to our next port-of-call, Rouses Point, New York. Here we would welcome the public for one day, take down our sailing rig the next and on Thursday, June 21st, cross the border for our extended outreach program 1812: Commemorating the War: Celebrating the Peace in Canada and beyond.